Comex Will Not Wait for iOS 4.3 / 4.2.5 & Verizon iPhone 4. Untethered Jailbreak for iOS 4.2.1 On Its Way? 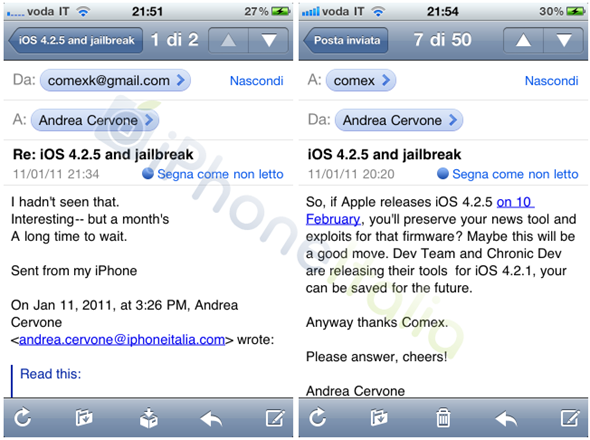 An Italian site contacted Comex today to ask him about whether he is going to wait for Verizon iPhone 4 to launch, and the next iOS release, that is iOS 4.3 / 4.2.5 before releasing his untethered jailbreak. Comex swiftly replied that one month is too long a wait to keep the long-awaited untethered jailbreak from releasing. So, if Apple releases iOS 4.2.5 on 10 February, you’ll preserver your new tool and exploits for that firmware? Maybe this will be a good move. Dev Team and Chronic Dev are releasing their tools for iOS 4.2.1, your can be saved for the future too. This response of Comex is completely opposite to his last reply where he said he was going to wait for Apple to release iOS 4.3 (or 4.2.2/4.2.5). So is the untethered jailbreak for iOS 4.2.1 ready? will he release it soon? We will keep you updated as always. Stay tuned.